Jobu weighs in on Curtis Gra nderson, and whether or not he’ll be a Yankee next season. Last year, I would have told you that this was probably a no-brainer type decision. Even though he’d struggled at times in 2012, Granderson was still coming off of his second consecutive 40+ home run season, and fit very nicely in the order surrounded by Derek Jeter, Robinson Canó and Mark Teixeira. In fact, Granderson had the most homers in the league over the course of those two seasons. He was also barely 31 years old, so a four or five year deal would have made decent sense. Unfortunately, 2013 didn’t go as planned for the Yankees outfielder. So what should they do in 2014? Let’s discuss. I start with the bad, because not a whole lot went well for Curtis in 2013. During his first at bat of Spring Training, he was hit by a J.A. Happ fastball and broke his forearm. That’s the last we would see of Curtis until May 14th. 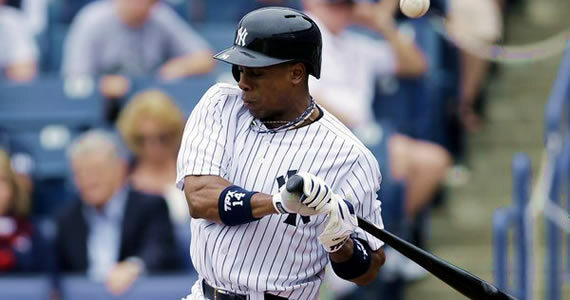 After exactly eight games, Granderson was hit by a Cesar Ramos pitch in a game against the Rays and broke his hand. He missed ten more weeks, not getting onto the field again until August 2nd. Talk about some tough breaks, right? Most guys will tell you that it’s hard to get going when you miss a half season. I think that goes for just about any profession. You can’t be expected to come back to work after a few months and immediately produce at a top level (at least that’s what I tell my bosses when I come back from vacation). That’s pretty much what happened to Granderson in 2013. In 61 total games (53 after returning from the broken hand), Curtis hit just .229/.317/.407 with 7 homers and 15 RBI. He did steal 8 bases, but it was otherwise pretty much a lost season for him. The problem he faces now is that this was supposed to be his walk year. After hitting 41 homers in 2011 and 43 in 2013, another similar season would probably have netted him a big time contract. Now, after losing this season, is that going to affect his open market value? This is actually a very tough decision. 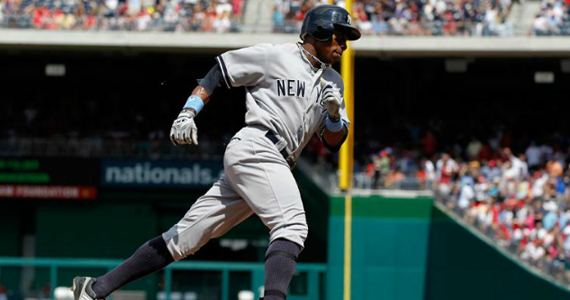 The Yankees will, undoubtedly, extend Granderson a qualifying offer. There’s reason for him to consider accepting the offer. The $14.1MM would represent a slight decrease from the $15MM he made last season, but it would provide him a chance to erase the memory of a horrible 2013 season and set himself up for what would likely be his last big contract after the 2014 season (he’s going to be 33, after all). That being said, I think Granderson, a guy that can play all three outfield positions and hit 40 homers, will attract plenty of attention on the open market. He’d be foolish to not at least sniff around the market. I’m not sure if he’ll get more than $14.1MM per year on whatever contract he signs. As impressive as his home run totals have been as a Yankee, he hasn’t hit higher than .232 since 2010, his defense is slipping (at least in center) and, again, he’s 33. Guys don’t suddenly get better at that age. Also, although he still puts up impressive power numbers against lefties, at times he has looked to be developing a hefty platoon split (like in 2012). However, he’ll surely land some kind of multi-year deal. At this point in his career, coming off an injury-prone season, he’s probably looking more for stability than a couple of extra million for one season. If the Granderson turns down the qualifying offer, the Yankees should still look to bring him back, but it’s going to have to be a very team friendly contract. Ideally, I’d say offer him three years at somewhere between $10MM and $12MM per. I don’t think I’d go past the three year mark. Also, if it comes down to signing Granderson or bringing back Robinson Canó or bringing in a guy like Masahiro Tanaka (tired of hearing that name yet? ), I 100% let him walk. I like what Curtis has done for this team, and he seems to be a wonderful guy, but he shouldn’t be a guy that prohibits you from making other moves at this point in his career. If Granderson walks, there are some options through free agency. My pick to replace Grandy is Carlos Beltran. The 36-year old Beltran can be had for a lot less of a commitment, and probably less per season money than Granderson too. Even if you have to pay Beltran $15MM, it’s a lot more appealing to do that for two years, and not four or five. Also, Beltran is a post-season hero, and it’s no secret that he’s been trying to play in the Bronx for like ten years. He wanted to take less money to sign with Yanks back when he signed with the Mets, he wanted to sign with the Yankees after leaving San Francisco and the odds say that he’d probably want to come to the Bronx now, possibly to finish his career. He’s a guy that has proven that he can still hit, putting up a slash line of .296/.339/.491 with 24 homers and 84 RBI this past season. He has also worked hard to stay off the DL, which is something he had a lot of trouble doing in his early 30s. If anyone knows how to help older players stay healthy, it’s Joe Girardi. This might be a match made in heaven. I know that we have clowned the Yankees for being too old, but they don’t have any young outfielders that will be major league ready in the next couple of years (save maybe Slade Heathcott), so a short term deal for a guy like Beltran makes a lot of sense. 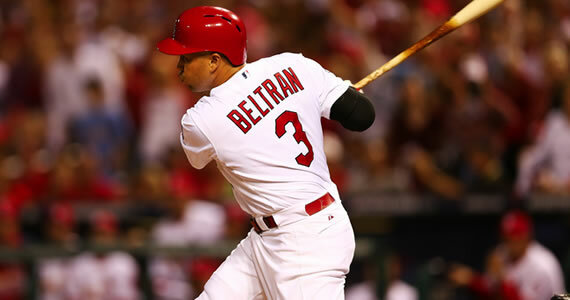 I think that, if Beltran is willing, that’s who should be in right field come opening day 2014.